The Ames test1 originally utilized strains of the bacteria Salmonella typhimurium that carry mutations in genes involved in histidine synthesis. These strains are auxotrophic mutants, i.e. they require histidine for growth, but cannot produce it. The method tests the capability of the tested substance in creating mutations that result in a return to a "prototrophic" state, so that the cells can grow on a histidine-free medium. A few years later, Green and Muriel2 established an analog test system for E. coli strains. 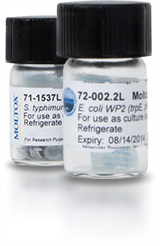 Salmonella typhimurium strain TA1535/pSK1002∗ is offered in proprietary transport medium (PTM™). The bacterial strains contained in STDiscs™ and ECDiscs™ are potential etiologic agents and are intended for use only by those skilled in the safe handling of potentially infectious agents. ∗ according to the German “Gentechnikgesetz” TA102 and TA1535/pSK1002 have been classified as “genetically modified organism” (GVO/GMO) of risk group 1/BSL1. Please check for appropriate regulations in your country. 3 Oda Y., Nakamura S., Oki I., Kato T., Shinagawa H. Evaluation of the new system (umu-test) for the detection of environmental mutagens and carcinogens. Mutation Research 147(5):219-29, 1985. 4 OECD Guideline 471 for the Testing of Chemicals, Section 4. Test No. 471: Bacterial Reverse Mutation Test.